The moon meets up with the "morning star" before sunrise. See the crescent moon make a close approach to Venus in the predawn sky on Tuesday, April 2. 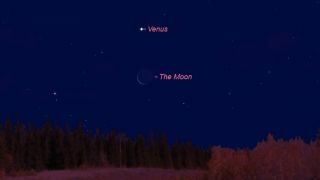 The 27-day-old moon will pass about 2.5 degrees to the south of the bright planet Venus when it makes its closest approach to the planet at 2:11 a.m. EDT (0611 GMT), according to the skywatching website In-The-Sky.org. About 2 hours earlier, the two objects will be in conjunction, meaning they will share the same right ascension, or celestial longitude. During this conjunction and close approach, both Venus and the moon will be below the horizon for skywatchers in the U.S. However, they will still appear close together when they rise in the predawn sky a few hours later. To get the best view, you'll want to find a flat, clear horizon to the east that is unobstructed by buildings, trees or mountains. That's because Venus and the moon will still be pretty close to the horizon when the sun rises and washes them out with daylight. In New York City, for example, Venus will rise at 5:24 a.m., followed by a moonrise at 5:43 a.m. local time. The pair will be visible for about an hour before the sun rises at 6:38 a.m., when they will be only 9 degrees above the horizon. For reference, your fist held at an arm's length is about 10 degrees wide. You can figure out exactly what time the sun, moon and planets rise and set from your location with this astronomy calculator at timeanddate.com. Skywatchers in the Southern Hemisphere will have a better view of Venus and the moon this week, because the planet will rise even earlier in that part of the globe. On the other hand, skywatchers in the far north may not get to see the pair at all, because they will rise too close to the sun, according to EarthSky.org. Over the next few days, the crescent moon will become thinner and thinner until it essentially disappears from view on April 5, when it reaches a new phase. While the moon is temporarily absent from the night sky, you can take the opportunity to check out some other visible planets. Jupiter and Saturn will already be high in the sky by the time Venus rises each morning, and Mars can be seen for a few hours after sunset. And if you're doing some early-morning skywatching, keep an eye out for the tiny planet Mercury, which will be faintly visible near the horizon right before sunrise.